Stayed Apr 14 The villa was simply fantastic! The architecture is impressing and the interior design is high level. Staff was really caring! This was a great vacation, we can really recommend staying in this great place. Located within an exclusive residential area of Choeng Mon this striking luxury villa offers private and peaceful living within easy reach of the beach and an array of restaurants, shops, local culture and nightlife. Nestled in the island's north east this contemporary home offers bright and spacious accommodation within it's private walled garden. 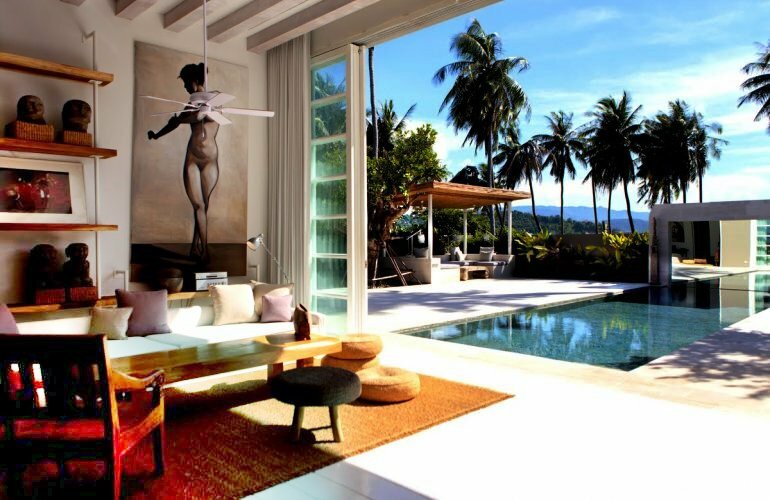 This architect-designed villa offers super-chic open-plan living with an abundance of bright and airy island charm. Situated in a private walled plot, this luxury property boasts a stunning private pool and sun deck, tropical gardens, generous dimensions and a wealth of effortless appeal. Choeng Mon beach is just a short walk away with its silvery sands and crystal clear waters. The lively buzz of Chaweng town is just 10 minutes by car, as is Bophut Fisherman's Village with its distinctive urbane vibe. The property is fully air-conditioned with three double en-suite bedrooms, an open-plan living room, designer kitchen and dining area for six guests plus a separate T.V lounge. Floor to ceiling glass doors open from the living room and master bedroom to an impressive sand-stone sun terrace with infinity-edge pool, imposing mirror feature, outdoor kitchen/bar, shaded lounge sala and palm-fringed gardens. The grand living room is simply sensational with high white ceilings, cool wooden flooring and modernist designer fixtures and furnishings. The room features a traditionally-styled lounge space with organic rug, teak coffee table, designer chairs and scattered floor cushions. In the far corner lies a minimalist-style kitchen with hidden units and high-spec equipment as well as a bright breakfast bar with designer cushioned seats. Adjacent to the kitchen is an Asian-inspired dining area with seating for six guests as well as a lounge room with comfortable sofa seating and large wall-mounted satellite TV with DVD player and high-spec sound system. Huge glass doors allow access to the sun terrace plus a fusion of light from outside in with seamless views across the pool and gardens. The grand master bedroom is located next to the main living room. This stunning suite is awash with white, featuring an impressive futon-style double bed, large white sofa, built-in wardrobe, traditional-style coffee table, desk and TV unit. An imposing heavy teak mirror adorns the wall, as well as modern artworks and eastern accessories. The en-suite bathroom features elegant stone tiling, a stylish terrazzo tub, a large rain shower and twin basins. At the far end of the bedroom are huge glass doors which open onto the inviting sun terrace. A further bedroom is situated behind the lounge with a double bed, designer furnishings and en-suite bathroom. The final bedroom suite is located upstairs boasting a large double bed, heavy wooden desk, lively artworks, chaise longue and en-suite bathroom. Glass doors fold away onto a large balcony with unique contemporary seating and views across the pool and gardens. To the rear of the property lies large stone-tiled sun terrace with a sizeable lap pool. A mirror feature at the far end of the garden reflects light onto the water for spectacular soothing effect. On one side of the pool is a unique seated area and an impressive shaded lounge sala with sofas and a coffee table. On the pool's opposite side is a modernistic kitchen bar and charming alfresco dining area with seating for six guests. This stunning outside space is framed by a palm-fringed wall for extra security and seclusion. This enchanting home is set back from the road with ample parking to the front. Complimentary WiFi internet access is provided.